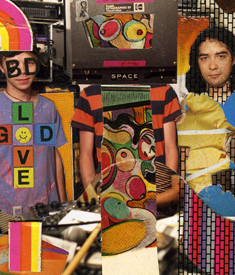 Brooklyn’s Black Dice release their third album for DFA Records, entitled Broken Ear Record. Their titles have always been telltale signs for their recording states of mind. Open space and seeking a surfer’s paradise informed the sprawling topography and ebb and tide of 2002’s breakout effort, Beaches and Canyons, while last year’s dense noise foliage of Creature Comforts was by turns animalistic, unpredictable. For Broken Ear Record, the title conjures numerous images and sensations. Think tinnitus (easy for neophytes and noise veterans alike that have caught their live performances); think punctured ear drums and the destabilized loss of balance that follows it; think sensory failure, shattering, and a new openness emergent from the shrapnel. Broken Ear Record is all of these conceits, and none of the above. “Oh, Broken Ear Record was just a phrase that one of us misheard,” sound-manipulator (and sometimes singer) Eric Copeland explains, “The title fit without standing for something.” Concise, concentrated, and most crucially, cathartic, Broken Ear Record wastes not a note. Let it shatter ears and expectations alike.